Your college admissions application is your chance to make a good first impression at the college of your choice. Colleges and universities are looking to attract the best students to their campuses, and they review every application closely. It is important to present a solid, clearly thought out, submission when you are applying to university. How you prepare your college application can determine whether or not you pass the admissions process. Let's take some time to look at some particulars common to all college applications, and how best to approach them. A students high school GPA is the first aspect of a college application that an admissions panel considers. Universities are looking for students with the ability to apply themselves to their coursework, and to ultimately progress to graduation. While extracurricular activities will prove to the admissions board that you are well rounded, and an asset to the campus community, grades remain a deciding factor. The student who works hard in high school, and has an impressive history of academic achievement, has the better chance of being accepted to their college of choice. Closely tied to any student's GPA is their high school course history. The college admissions board looks at more than just a student's grades, they consider the courses being taken. A history of taking Advanced Placement classes will show the admissions board that you are committed to your education, and are prepared for the challenges that college will bring. AP courses often require college level work, and a top grade in one of these classes will have more weight than a top grade in a regular class. This should not imply that students who performed well in regular classes will not be admitted to college. Quite the contrary. But it does show the degree to which the college admissions board scrutinizes the applications it receives. Students who have achieved top grades in more challenging classes will score higher in the review boards estimation than students who received top marks in a regular course of studies. Your student standing, or class ranking, is determined by the grades you have earned during your high school career. How you compare to other students in your graduating class is an indicator of how you will fare in the more demanding college environment. 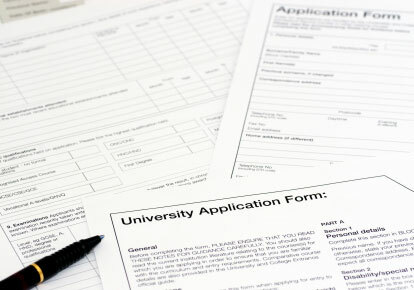 Some colleges require that eligible applicants must be graduated within a certain top percentile of their graduating class. The higher your class rank, the more likely you are to be passed by the college admissions board. Your SAT and ACT scores are further deciding factors in the college admissions process. While they will not necessarily make or break a student's chance of acceptance, they do help to add extra weight to a college application. Colleges want to see students that can demonstrate a broad range of knowledge, and that have the skills to reason and think logically. The ACT and SAT testing process gives the admissions board the opportunity to assess a student's capabilities, and to see beyond the student's high school class scores. A top performance on your SAT or ACT exam can also help to balance any deficiencies in your high school GPA. The college admissions essay is one of the most important aspects of any application. It is your chance to speak to your educational and career goals, discuss your past successes and to explain to the review board why you would be a good addition the the college's campus. This is also an opportunity for the admissions board to see how you express yourself, and to assess your writing skills. An outstanding essay can ultimately sway an admissions board, and has helped to get many a student with less than stellar grades accepted to the college of their choice. Your admissions essay is your chance to let your personality shine, and to convince the college board that they want you in their student body.